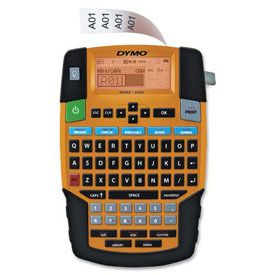 Dymo RhinoPRO 4200 Label Maker - The DYMO Rhino™ 4200 gets labeling jobs done fast and done right. Easily navigate the familiar QWERTY keyboard. Use one-touch Hot Key shortcuts to quickly create and format wire/cable wraps, flags, Code 39 and Code 128 barcodes, fixed-length labels, module labels and more. Print labels up to 19mm wide in flexible nylon, permanent polyester and durable vinyl materials, PLUS print directly on heat-shrink tubes. Save even more time with great features like the Favorites key which provides single-key access to commonly used labels, symbols and terms; and the Custom key, which eliminates repeated steps by saving customized settings. Includes: Rhino 4200 printer, Quick reference guide, 1/2" (12mm) black on white vinyl tape.